We helped events specialists Equinox launch their new brand, Flaunt, creating a website that has been essential for generating enquiries. 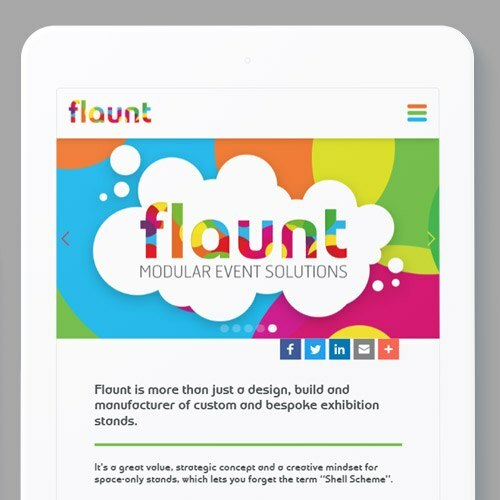 Flaunt is a brand-new division of Equinox, a live events and exhibitions specialist. While Equinox deliver events and displays of all shapes and sizes for huge brands, all over the world, Flaunt was launched to provide an all-in-one solution for smaller businesses, on a tighter budget, who still want an eye-catching exhibition presence. Flaunt bring their global expertise to everyone, with a great level of service no matter how big, or small, your budget might be. Flaunt was a brand-new division of an existing company, and it needed a web presence – fast. They wanted a holding page to capture the enquiries that were already coming in, with a full website design based on their branding to follow. This was a new brand, starting from scratch. Branding was taken care of internally, and colour was a huge focus – Flaunt’s design team selected 14 different colours that they wanted to use as part of their logo, as well as in big, bubbly and eye-catching treatments. It was up to us to translate this very unique and colourful brand into a website! The first step was to create a holding page with an enquiry form. 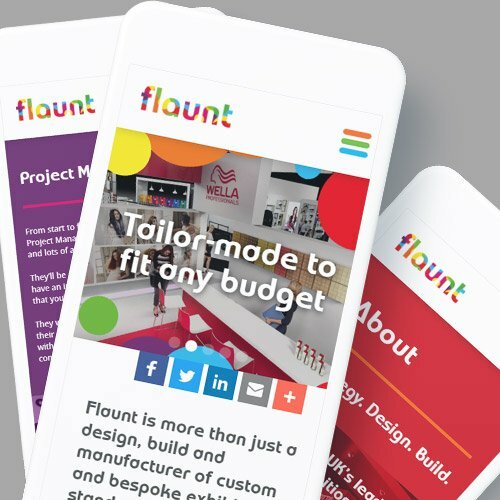 Flaunt was already starting to get enquiries and take on projects before they even had a website, so we needed to get something together quickly. This was essentially a splash screen built in Webflow, putting the focus on the big, bold logo and the brand colours, with a simple form to help the team manage enquiries while the full site was in development. Our designer had a lot to work with for the new site design – with so many colours involved in the brand, it would be a shame not to make the most of them. Five were selected to colour code the various sections of the site – a different colour for the About, Services, Portfolio pages and so on – and the rest were introduced using the bubble designs, creating an eye-catching frame for image sliders and text content sections. The design needed to be big, bold and engaging, so we focused on using big headers to display the copy the Flaunt team has written, and large images to show off the exhibition stands built by Flaunt – all in a way that matched the branding. Big buttons contrast with subtle animations and transitions, making a site that really comes to life in an engaging way as you move around it. The site was built in WordPress, giving the Flaunt team full control over the back end with a content management system (CMS) that is really easy to use for adding new blogs, portfolio case studies, and service details, as well as updating SEO metadata. 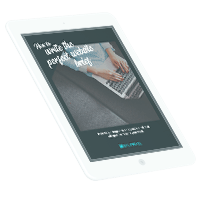 The team have the option to expand the portfolio section with a custom post type that will take users to a standalone case study when they’re ready – they have complete flexibility over what they do. The Flaunt team are already well-versed in WordPress, so they have a bit more control over the back-end than is usual for our projects – we’ve put processes in place to ensure version control, and that the site can be updated by both us and them without any data loss.